Team-friendly todo list tracking keeps tasks organized and visible to your team. Gain complete visibility to all of your event’s critical-path items. Know who is doing what, and by when. 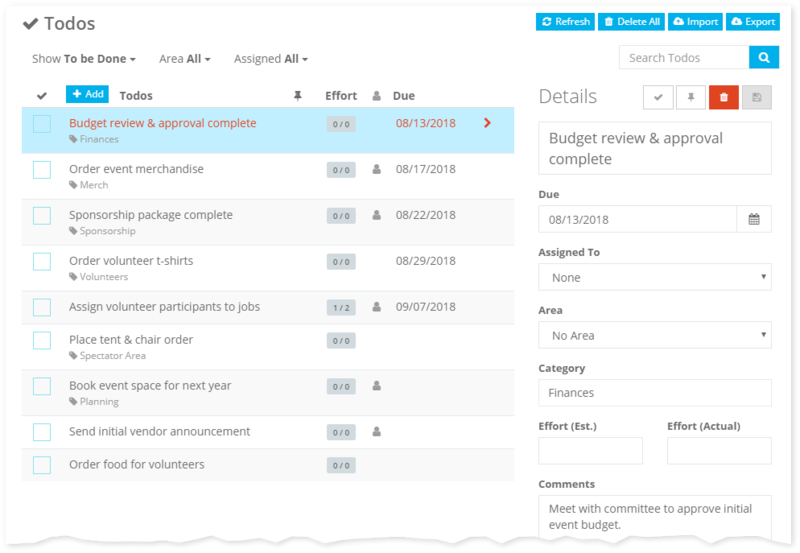 Easily share todo items and delegate work to other event team members. Already have a list of todo items? No problem, use our simple data import features to quickly bring existing todo items into ClearEvent and start sharing work with your team. Reduce succession planning risks associated with organizer turnover. Todo lists are great for quickly transferring responsibility and getting new team members up to speed and productive. When your event is over, use our Event Rollover feature to automatically reset your todo list so that it’s ready to go again for your next event. Keep track of your event team’s critical-path todo items using one simple tool. Always know what your event team is working on.